Please tell me about Cyrus? Was he born in Persia? Where did he go to school? How was his childhood, his youth, and his coming of age? He seems to have many good friends. He must have been a good friend himself. Did he have a sweetheart? He looked so handsome and wholesome. What were his hobbies? Any special interests? Cyrus was in the hospital for the past 2 months, and had not ingested food for the past days. What ailed him? I hope he did not suffer much. Our thoughts and prayers are with you and sister Minou, Laila, and Arto. I pray you can, at this difficult time, worship the King, the creator of Heaven and earth. Our God reigns! P.S. : Did I detect a mischievous smile of Cyrus’? Or was it there most of the time? Cyrus was born in Jakarta's Kebayoran Baru Clinic for babies right behind our old house at Jalan Birah II, No. 82, Blok S3, Kebayoran Baru, Jakarta on Nov. 9th., 1973. The clinic is still there. Cyrus, 25, was our last child, and our youngest. The oldest is Laila, 33, an environment engineer, and lives in Jakarta. His older brother, Arto, is 32, a diplomat in New York and has a family with two boys. (Right photo, Cyrus, Laila & Arto, June, 1989). I named him Cyrus because on the second night of his birth, I got a message, a flash in my mind, to call him Cyrus. The name Agung or Great came naturally as it reflected his Mother’s Persian heritage; hence, Cyrus Agung or Cyrus the Great. I did not get any “flashes ” to name our other children, and let the seniors of the family, with a little prodding from our side, to name them instead. Later on during the years as he was growing up, a kind of 6th. sense was building up inside me that I had to protect him extra carefully because I knew, somehow, that I had failed him before. I was not sure what I had failed him in. But the consequences were, at that time, very heavy, and somehow I knew I did not want to go through that again. As the years progressed and he became older, this 6th. sense lingered on and became stronger. It was a deja vu, already-experienced feeling. Whenever he was in a “dangerous” situation, for example, the first few times he rode the big Honda 1,000 c.c. or Kawasaki Ninja and was still an inexperienced rider, I was truly fidgeting, telling myself over and over again, why did I let him go on the big bike. But Cyrus was confident he could handle the big bikes. As proven later, he became very adept, and impressed many of the older and more experienced riders, including a California trained motorbike racer. He did other things which, in my mind, was dangerous like, for example, I saw him climb to the roof top of our houses, where the lightning rods are installed at the age of 2.5 years, just barely a little toddler (right photo, in Jalan Birah II), first in Jalan Birah II/No. 82, Kebayoran, and our house in Jalan Arteri Puri Sakti (now called Pangeran Antasari), a major 4 lane main (arteri) road. I felt—unconsciously—Cyrus was placed in our care to test us, me his father in particular, as his mother did not really feel his existence was a test for her. So, there was this unconscious awareness that this was a test from my part. But not with the other children. So when he passed away, I felt that I failed this test, again ... When we brought him home from the hospital that Thursday night on the 28th. of January, I went into a corner of my living room where there was no one, broke down and cried and cried, and all I could feel was this pain of failure that was surging and spilling out of my being ... I failed again ... I failed him again was all that was pouring out of my being. My poor friends, especially Arsineh, who were trying to console me could not understand why I kept saying these words. But inside, the pain that was pouring out of my being was ... I failed him again. I never told Cyrus that I felt his existence was a test. So, Cyrus didn’t know about this particular feeling. It is irrational, and unexplainable; but this feeling of failing him again is there. And I shall take this feeling of failure to him to my grave because it is now carved in my soul’s memory, like my previous failure to him had been carved in my soul’s memory, and somehow when he died before his time, his life unfulfilled, my soul remembered again. I cannot go into this unexplainable feeling because I cannot explain it. I can rationalize and go back into events that “...I should have done this...”, and “I should have NOT done that...”, and then find the cause of this pain. Or perhaps console myself in the dogmatic explanations of others who have never felt the pain of losing a child. 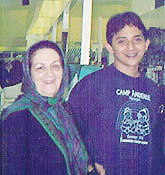 (Left photo with his Grand Mom, Tehran, 1997). Because Iam a rational person, I try to rationalize this feeling by finding its cause. Rationalizing it that it was not my fault, and that I did not fail him doesn’t work. There are always well meaning friends who give me counter arguments that I did not fail him ... even Cyrus’ own Mother who, bless her, was only trying to comfort me. But my soul is telling me otherwise, and I am only lying to my inner being if I believe these words of consolation. While most parents who loose their child will feel they have lost their child, my burden is not only loosing our son. But added to this pain, we lost him because I did not take good care, or paid enough attention, to what he was doing, how he got ill—for example, 2.5 years ago when X-rays showed he had a spot on his left lung, I should have done something about it—until my mind becomes numb with the things that I as his father could have done better. If I have to rationalize something, it is this: one, I lost my son, and this is a fact. Two, I lost him because I did not take enough care of him, which friends tell me is debatable, and therefore I am not entirely to blame; and three, I failed him again before, something which no one can argue about because it comes from my very inner being’s subconciousness. It is irrelevant whether anyone else believes it. What is relevant the experiencer believes it because he experienced it. (Left photo with older sister, Laila, at their brother's wedding, Arto, in Jakarta). Whether I failed him before through illness – or whatever – my inner being which is not telling me how I failed him before, is now telling me that this time I failed him again. And this repetition of failure to one’s son, especially at the age of 25 when he was ready to go into the world, and his unfulfilled life is cut short, is a pain beyond any words of description. People who have never had a child leave them are in no position to feel what parents feel. Especially when a child has become an adult – the parents can exchange ideas, and they in turn can learn from this child – is something one can not know, unless one went through the experience of being a parent of an adult child and then losing him/her. This feeling of deja vu, of having seen (felt) it before reinforces further one’s personal concept of reincarnation (a concept which I never even bothered to think about until later in my late 40s), of having lived before. Because no amount of lifetime sermons in Churches or in Mosques, lifetime reading of the Holy Books, for or against reincarnation, can convince anyone unless one experiences this himself. No one, I repeat no one, can feel what parents feel when we loose a child, unless one becomes a parent first, saw the child grow up, and then die on them. The pain is so devastating that bereaved parents will trade their lives for their child’s, and trade all their material wealth – and become a pauper – just so not to loose their child. And even to think about committing suicide – an unthinkable thought for all rational persons – when they loose their child ... if not for the sin of throwing one’s life unto the face of God ... and if not for the anger and hurt bereaved parents will cause to their other children and loved ones still to live their lives. That's how painful loosing a child is. Bereaved parents are like those whose house was burning. They were in it; were badly burnt and injured, but they survived with burnt pains. But the observer sees the burning house, sympathizes, and only feels the heat. The observer – those who have never lost a child – will never feel the pain of those who were burnt, no matter how hard they try to imagine the pain; the long recovery needed for the burns to heal – like the recovery from thoughts of committing suicide and bargaining with your God (I’ll trade my life for my child’s), and the scars that stay which will never go away – that mental scar lingering in the back of one’s mind that something is missing in their lives, unless the observer was burnt himself – and experienced the death of his child himself. And ... do NOT think this pain and tragedy whether by sickness like Cyrus, or by any other kind of tragedy – accidents, war and other unmentionable tragedies, “only happen to other people. Not us” – as we once thought – when we started this family in our mid 20s and now in our mid 50s autumn years, and after 35 years of parenting. It can happen to anybody, at any time, and hit you without warning like a bolt of lightning. So love and appreciate your Child so if the Creator takes him/her away – and heaven forbid this won’t happen – you know that as a parent you did your best. Because the worst thing anyone can feel is guilt, the guilt that comes from within you–that perhaps one could have been a better parent, and had done things in a better way. The older and longer this child is with the parents, the deeper the pain the parents feel this devastation because the older child has established his/her new world which he/she is preparing to step into, like new circle of friends and their very individual and their very own unique experiences which we as parents then became part of. All of this is suddenly gone. Single persons, married couples with no children, can never visualize, or feel the utter deep pain parents feel when they loose a child. They can only experience it when they become a parent, and if , I repeat if, their child dies on them. If parents with children have never experienced the death of their child, they, too, will never feel this pain. They, too, are only observers...and will never know how it is to have their young promises yanked from under their feet. Out of 100 parents, probably about 5 parents, or 5% of them, will experience the death of a child in their family. Especially when a child becomes older, first a toddler, a young teenager, and then an adult. And I repeat, the older a child becomes, the more painful it becomes because not only the parents, but his/her other siblings have come to know the departed child and the wider circle of friends he/she created. So, there are not many parents who will feel this pain. Which is just as well as no one would wish them to ever feel the pain and devastation of losing their child. All this, assumes that there is no war or unusual activity which bring children into abnormal dangers that may result in their deaths. My feelings with the other children were they were strong character wise, including Laila who, as a strong willed young woman, always managed to get things her own way. I did not have an unconscious feeling that their existence was a test. I felt they could take care of themselves; and it was proven to us, they did just that – even when they were just toddlers. Laila’s homepage from her Father’s perspective is here. Although my other son Arto got lots of beatings in his younger days–mainly because he went out of his way to pick fights, not because people picked on him, I knew he could beat right back – and I was right, because in the end he was always the winner. This may, or may not be true in reality; but at least, this Son had the decency to let his old man think that, which I appreciate. But I still think, and am convinced, he could beat right back. Arto's homepage from his Father's perspective is here. Cyrus was not like his brother or his father, aggressive, physical, like when his father took an East German scientist out of East Berlin (as recounted in our homepage) in 1964 and succeeded, while three other attempts by others failed, risking being shot to death, or jailed for 20 years. His personality was what one can say as finer, as you can see in events which I describe below. He never swore, although he was in such great pain and continuous high fever of 39 to 41 degree celsius (39 to 106F). But Cyrus’ character in other ways was a mirror of myself, even down to small matters like the type music (jazz, fusion), movies, his favourite foods, playing different instruments like the guitar, drums, etc., the style of his driving, aggressive and weaving in and out of traffic with lots of caulculations–like the way he handled my big 157 horsepower Kawasaki Ninja 320 kmh (198 mph-capable) super sport motorbike, the Ferrari and Lamborghini of motorcycles, and impressed a much older California-trained motorcycle racer who admitted he was beaten by Cyrus. Cyrus, I unconsciously felt, also needed the protection of his older brother, not just from me as his father. And his older brother, Arto, took care of him, on many occasions. One day, for example, I had to send his older brother to make threats to kids in his school, Ora & Labora, where the kids were picking on him when he was at grade school (before SMP junior high, pushing him around because he did not fight back because there were too many of them, unlike his older brother who went out of his way to pick fights and didn’t care how many opponents he had). During his SMP and university years onwards, he had no problems because he was popular. The girls at school called him imut-imut (small and cute), recalls Joanne at the 7th. day prayers, a model and TV actress and Cyrus classmate at SMP-SMA who towered over him. His older brother, in his own way, was there always to look after him, even later on when Cyrus became an adult and needed other forms of help. The fact was, when Cyrus asked for his older brother's help, his Big Brother gave it. Cyrus was what people would consider as a “nice guy”, unaggressive in his social surroundings, accommodative, pleasant to talk to, never a harsh word to anyone, and this is hard to believe – I who had known him for 25 years never heard him swear. He could be angry about something, or someone, but I never heard him swear, use four letter words, or words like SOB. This was also brought forward by his girlfriends and boyfriends when they were watching over his remains. If you wish to know more about my family, or Cyrus in particular, please go to his homepage at http://the-businessman.suryo.net, his Mona Lisa smile 18 hours after passing away at http://eulogy.suryo.net , or through the family's homepage at www.suryo.net . From there you can navigate and find out more about the 5 individuals which make our family and what they do. Or click on names and sentences which are underlined. This will take you to that particular homepage. In Nol Kecil pre-school he went to Budi Waluyo, Kebayoran, directly to Kelas 1; he never went to Nol Besar. Then he went to Ora & Labora in Blok M, Jakarta. Yes, he did have girlfriends, usually the ones he liked were mixed Indonesian-other nationality. But he liked one in particular one who was not, and her name was Mary. They were all good looking. But the last 3-4 months or so, he did not have a girlfriend. He was choosy; one, he would say she was “materialistis”, another “cannot be depended on”, and so on, and so forth. For sure, he did not have a girlfriend who was like his Mother who was dependable, good looking even as a Grandmother three times over, and very conscientious about getting something – anything – done right, and on time. He was a handsome kid because of his Mother. But he did not make a fuss over this and took it in his stride. In fact, I believe he himself did not think that he was anything special in looks because when the young women in the streets would glance admiringly at him, he didn’t pay any attention. But I, as his father, was proud the women paid attention to him during the times when Cyrus and I were in the same car together. A child is, after all, a reflection of one’s parent. But beauty is in the eyes of the beholder, and if you wish to visit the different homepages, you can make up your own mind. His quickness to pick up ideas, particularly money-making ideas and to expand on them came from his Dad. His hobbies were making money and the paranormal. He started off at the age of 2.5 years by charging his Mother’s guests for “parking fees” (Rp 50 at the time) whenever they visited the house, first directing the driver terus, terus... and then extending his small hands for the fee. The “world has lost a business genius ...” was the praise given by the head of a well-known major global business conglomerate who did not know Cyrus, but because of God’s gift was able to see the “book of knowledge”, communicate with what he referred to as the “Universal Intelligence”, and observe Cyrus in the other dimension in both happy and unhappy states. He is happy, this man said, because he is no longer suffering. But he is unhappy because he had to suddenly leave his family. Had he lived, this man said, he would have impacted the business world not only here in Indonesia, but elsewhere, too. This man who gave up his material wealth, his respected business position, even his family, and Roman Catholic religion to become a Buddhist Monk because of “God’s call”, comforted us 3 days after Cyrus left us. I believe what this man said about Cyrus because as a businessman and head of a well known major international business conglomerate, he was successful in this material dimension, and I consider his material achievements something to emulate. More than that, on the spiritual side to give up everything to help other people, means he has depth and spirit which not many of us possess. Years ago, persons told his Mother that “ ... your youngest son will be known and famous, mainly for his business achievements ...”. Several days ago after he passed away, a friend told us, “...Cyrus had a long lifeline on his palms...”... all to be proven wrong. On the paranormals Cyrus would come home with all sorts of these expensive, highly concentrated perfumed oils which some of the orang pintars claimed can do so and so... whatever they were. He intensified his Islam religion after staying in the Suryalaya pesantren for 3 months, and became quiet adept with his religion. He, like us, believed in the universality and oneness of all religions, and he prayed with Shane your sister, too, in her Christian religion. About food, Cyrus ate everything. Even to the last minute of his death. His Mom and Dad ate the hospital food; he refused it after 5 days after being in there for 17 days because he tires pretty quickly about the food. The MMC hospital food was quiet good, local, western or any other food which one can order for breakfast, lunch and dinner. It was high quality food; chicken were chicken breast, no skin. Meat was never hard. One day before his death, on Wednesday the 27th. of January, he had two half boiled eggs for breakfast, a bowl of bubur ayam rice porridge which a friend of his Mother's made especially for him, and later slices of pate sandwich for lunch. In the late afternoon (4-5 pm) he ate an order of fuyung hai, rice and fried wontons which I brought from Bakmi Gajah Mada in Blok M, Kebayoran. At 12:00 at night, he ate the rest of his fuyung hai. I went out searching for white rice because the hospital canteen and the restaurants were closed, but found a warteg who had hot white rice, right next to the fence of the MMC hospital. Early in the morning of Janurary 28th., the date of his death, he ate two helpings of nice bubur ayam (chicken porridge). Then an hour later in the morning he ate 2 half boiled eggs, and I ate the other two keeping him company. Then in the afternoon about 1:30 pm or so, he had a full plate of steak, fried potatoes, beans and carrots from the Continent Mall next door. All in the meanwhile consumed with 4 or 5 glasses of drinks of all sorts. He had a good appetite. At around 4 pm or so he had a visit from his internist. He seemed very concerned. Perhaps he had a dire premonition of sorts because he left Cyrus very unhappy, although there was no outward indication that the doctor should be unhappy. One could tell in his face, and he was most unhappy. He was going to give him another USG for his liver the next morning. At about 4:30 pm, Cyrus, his Mother and I were sitting, he in his wheel chair because he felt comfortable in it rather than his bed. We were talking, laughing and he was sipping his hot energy drink when during the visit of his lung specialist (in front of the lungs doctor), he coughed the normal cough. Then 2-3 seconds later he coughed fresh blood, and pieces of himself came out of his mouth and nose, then a third cough several seconds later, the same thing: and then on the 4th. cough, his lungs must have burst, flooding it with his blood. On his 4th. cough, he looked at both of us parents with a facial expression which said “... what's happening to me ...” Then while his Mom was holding his hands crying, pleading “don’t go ... don’t go ... please darling, don’t go ... Cyrus don’t go ...”... I didn’t have a chance to say anything, not even to say “... son give me another chance ...” nothing! While his poor Mother only kept saying “don’t go ... don’t go ...” while holding his hands. Then his hands went limp, and he was gone. All this was within some 20 to 30 seconds since his first cough. His lung doctor was taken aback, shocked, was not prepared, and for those first few seconds couldn’t believe what was happening in front of him. While there was an additional doctor and at least half a dozen nurses who rushed in all types of equipment in less than 1 minute, including a suction machine which sucked blood from his lungs, a defibrillator machine (a heart starting machine) and others, he was officially declared dead at 5:05 pm. The heart monitoring machine which was attached to him showed his heart still beating, erratically from 26 to 115, down and up again. But the lung doctor said 20-25 minutes later when I insisted his heart is still beating, said this was the medicines pumped into him that was beating his heart. His eyes were already dilated, he said, meaning that he was already dead. “I am so sorry ...” was all he could say, “I am so sorry ...”. His Mother and I will never forget the shock, and feeling of utter helplessness, of seeing and feeling him die. We shall never forget his face, his voice, his laugh, his smile ... and then his surprise as pieces of himself came out ... the expression of helplessness in our boy’s face when he died. His Sister, Laila, arrived 10-15 minutes later while they were still working on him but he was already gone. The initial shock was such that I could not even remember the phone numbers I usually call everyday, or the names of so many familiar people who were standing right in front of me helping us, consoling us and trying to do things for us. Minou and I as his parents are very well aware that in his death, He our Creator, was kind enough to us that He let his Mom hold Cyrus’ hands; that Cyrus did not pass away while his Mom went to get his favourite food at the Continent Mall, or while I was doing something and I was not in the room when it happened; or that it was not 3 a.m. in the morning when most people were not prepared because his death was less than 1 minute. We are also grateful that he did not die in a crash and that his body was not mangled; or he died in some war zone, or blown up to pieces. Or, that Cyrus, died like my cousin who just graduated from medical school asked for his morning coffee, and when it was brought to him, he already passed away, without any warning, and without any cause. In the last two weeks after Cyrus’ death, we heard of 2 devastated parents whose child, healthy, sporty, and were young working adults suddenly without any warning passed away. God, took them away ... just like that, without any warning or due cause. Yes, we are truly grateful for that; that he died in front of us, in front of doctors and nurses who had the best equipment to save his life. We are grateful that given the other choices of death, which other poor devastated parents experience, his death was in front of us, in front of those he loves. Cyrus was ill for a total of two months, starting after his birthday on November the 9th. He entered 3 hospitals, the first and second were the Tria Dipa Hospital, next door to the Sucofindo Building, at Jalan Pasar Minggu, and the third and last was the Metropolitan Medical Center (MMC) at Jalan Rasuna Said. His doctors later said Cyrus died of the same illness that Onassis died of, and that was, the staphylococcus aureus that had entered into his blood stream and triggered the destruction of his lungs. Cyrus died in exactly the same manner Onassis died, he said (coughed and then died). His immunity system was very low and that is why this staphylococcus aureus had been able to attack his body. He was tested for HIV at the first hospital, and three times at MMC because his immunity system kept deteriorating, all of which turned to be negative. The doctors at MMC were able to identify this staphylococcus aureus and destroy it 6 days before he died. But by the time it was identified, isolated, and antibiotics tested and chosen that can kill it, the staphylococcus aureus had done damage to his lungs. Cyrus’ illness, like the infamous e-colli, that attaches itself in hamburgers and bad meat, destroys the organs that it attacks, and turns it into mush. Looking back during his second hospital stay, I talked to him and said, “Son, your illness is serious ... I want you to be really careful after you get well. ... No smoking, no late nights ... no this... and no that ...”. At that time we had not known about the existence of the staphylococcus aureus, or that it was attacking his body, whose manifestation was temperatures of 41 celcius. He was sitting on his bed, and looked at me in my eyes in reply to my worried comments, and said, “... it's okay, Daddy. If I have to go, I will go ...”. He never realized that when he said that, my heart was so crushed. It said, ... it’s o.k. for you to say that. But how about your Mom, your Dad, sister and brother ... ? But I didn’t let on, his spontaneous reply truly hurt me when he said that. Then at another time before he left this Tria Dipa hospital, the two of us were alone, and he said, “Daddy, Iam sorry, Iam really, truly sorry for all the unhappiness, and mistakes I made to you and Mummy. I really am so sorry ... ”. Then he broke down and cried. But no, I didn’t do that. I just said to him, “ ... it’s okay ... ”. And for not doing this, and for not showing him that I love him, every time I remember his dying moments, I regretted I never hugged him and told him I love him. It is these little events, fleeting and once in a lifetime, that I since then regretted this inaction, which would have meant so much to him, and meant so much to me that I have learnt, never again will I ever ignore these little things that can mean a lot. But during Lebaran, the last day of fasting when everyone asks for forgiveness, he asked his Mummy for the shirt he wore when he entered the MMC hospital (the hospital supplies its own pajamas and hospital clothes). She put it on, buttoned him, then he said to her “...I want to ask for your forgiveness ... please give me your forgiveness ... please Mum forgive me for the mistakes I made ... ”. He cried when he asked for her forgiveness. She hugged him, held him, and she cried; told him that she forgave him for all his past mistakes, and that she, too, asks his forgiveness for her past mistakes to him. Mother and son clung to each other in forgiveness. I only wish, when I had the same opportunity weeks ago, I had done the same ... hugged him, and told him that I love him ... it’s okay ... Iam happy that at least, his Mom did not make the mistake I made of not showing my love for him. Two or three days before he died, I put him on his bed, and watched him go off to sleep. I looked at him, at his difficulty in breathing, the pain he was going through for the last two months, the high fevers he had to endure everyday of up to 41 celcius; he couldn’t lie down in the normal sleeping position because he couldn’t breathe, and in spite of all this suffering he never swore, only said “... go away, go away ... (pergi ... pergi...)” to his high fever and his cold chills. That night for the next 8 hours after I told him I love him, he never coughed; not even once because I was awake most of the time and his coughing would have woken me up. Something that has never happened in the last two months of his illness. His coughing started all over again the next day. At 6:30 in the evening, we brought him home in a white hearst. The Ustadt covered him in batik and white veil. We placed him in the middle of the living room which all our neighbours, our friends and his friends prepared. In the space of one and a half hour, the whole house was transformed. A rented tent covered the yard against the rain; 50 or so rented chairs were placed all over the house; the living room furniture where Cyrus’ remains were to be placed were removed and placed in the terrace; an old office conference table was dismantled and its top used as the base of Cyrus’ remains; material for the bathing area was prepared; carpeting from our 5 bedrooms were taken downstairs and arranged for the prayers and the ceremonies to be conducted the next day where his remains lay in state. Minou and I will never forget the kindness of these people who worked, initiated, and coordinated themselves among neighbours, friends and Cyrus’ friends because our house was empty most of the time for the past nearly two months. Our servants had not arrived from their Lebaran Moslem holidays when it happened. When the ustadt washed and cleaned him the next day at 9:30a.m. in a special enclosed area covered with batik, he himself did not believe that Cyrus was completely clean, and asked Laila’s friend, Yayo, who was helping him to also help him check it, too. All traces of his food and drink were completely gone! But after inserting the necessary equipment and water, from the top as well as the bottom of my boy's remains, they were completely and amazingly clean. Not one drop of residue, liquid or solid!! I did not bother to tell the Ustadt, Yayo or anybody, what Cyrus ate the day before, because they would not believe it if I did. It was at this point, when I was called in by the Ustadt and informed of what was in his mind an amazing development: he declared my boy Cyrus a sinless person because there were no traces of residue; but I was told to leave again while they redid the cleaning. A few minutes after that, I was asked to re-enter the enclosed bathing area and was told by Yayo, “Sir, we still could not find any residue. Cyrus was completely clean ...”. What is that suppose to mean, I asked? The ustadt replied, “that means, sir, he is pure (suci was the word he used). God had cleansed him of his sins.” And this was His way of showing it, the Ustadt said. While these words sounded kind of comforting, and reinforced what his Mother and I believed that his last two months of his life was only suffering, and that this suffering paid for all his sins, the impact of the Ustadt’s words did not come to me except later on. The Ustadt said he has heard of cases where remains were completely clean – which is humanly impossible, even though they did not eat solid foods and ingested only fluids (as had been the case with my own Father) – but this is the first time he experienced it himself, he said. The smile of his cold remains camewhen his older brother called from New York and was talking to his Mother. I had to interrupt their conversation so that his Mother could see Cyrus’ smile before, I thought, it would fade away. But it did not fade away. About the mischievous smile? This, in my mind, was truly a miracle because it happened 18 hours later after he passed away. When he passed away on Thursday, the 28th., there was no smile; when they took him in for his final bath in the morning of Friday the 29th., there was no smile. When the ustadt tried to eject any remains from his body, there was no smile. Nor was there a smile when his Mom washed his hair, her crying through the shampooing, and I my heart in pieces while I was shaving him, saying to him I promised to shave him while he was still alive. No, his smile came to be when after being moved from the washing area to the middle of our living room where he lay in state, already dried with his favourite towel which I keep unwashed as a remembrance, wrapped in batik, the Ustadt was starting to dress him in his white clothe, then halfway through his dressing, I was watching his face and thinking deeply about my failure to him as his father because God took him away from us as I did not look properly after him, when in my imagination, I thought: He’s smiling, a kind of mona lisa type, subdued smile! No, it cannot be! While this was happening, Minou was talking to our son, Arto, who phoned from New York one of many calls he made at that time and I said to her, come quickly Cyrus is smiling. I was afraid his smile might fade. But it didn’t, because I was in time to ask for some people to take photographs of his smile which, I thought, picked up his smile, a quiet subdued mona lisa type of a smile.